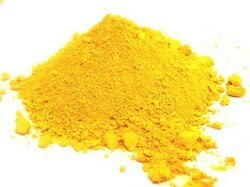 Manufacturer of a wide range of products which include iron oxide yellow. We are instrumental in manufacturing, supplying, wholesaling, trading and exporting Iron Oxide Yellow. The range we offer is processed using high quality chemical compounds following industry set guidelines. Our product line is used in uses in coating, printing paint, and coloring agent for building material, rubber & paper-making industries.